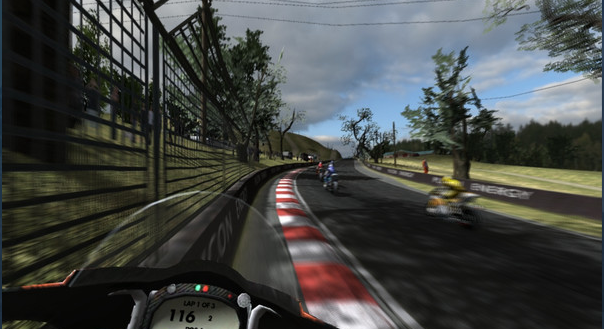 Yeah, the concept for this game is nothing new and there's no story, that doesn't matter though as you are not playing a motorbike racing game for the story anyway. The only thing that comes close to a story in this is that you start on the bottom of the racing tier and in order to gain new cups and classes, you'll have to win all of your races in the prior cups and classes. The courses in this game are based on real countries and loosely based on real courses. The Australian track does look like it's set in Australia as the track defiantly resembles the Bathurst track due to the roadwork and scenery. 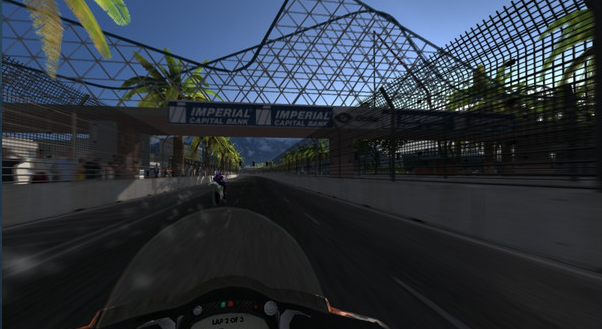 Gameplay is what you'd expect it to be but there is one twist that this racer has over most racers, that is that it has a VR (virtual reality) mode. The VR is aimed for the people that own an Oculus Riff, so the main view and menus are designed to be in your face (literally). Thankfully, you do not need an Oculus Riff to appreciate this game as you can change the view of the camera to where the game looks comfortable to you. 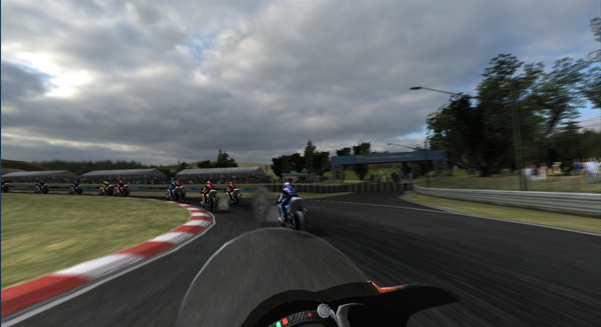 The downside is that the pause menu is integrated into the windshield of the bike, so seeing the pause menu on the other camera angles looks very awkward, plus you won't be able to see the pause menu on certain angles at all. It would've been nicer to see a more traditional pause screen instead, it would've been more comfortable for both VR and non-VR players in general. The gameplay, while simple, is very bad due to it being insanely buggy to the point of this game becoming unplayable. You will find yourself falling off of the track due to the bad turning, and I literally do mean that you'll fall of the track as there are some walls and ground that aren't very stable, so you'll fall into an endless sky that I like to call Limbo, it also gets the classic Daytona USA (1993) song, Sky High, stuck in my head (blue, blue sky). You won't only find yourself trapped in Limbo, you will also find yourself trapped in little islands inside of the track and won't be able to get out. Another bad part is that the AI (artificial intelligence) of the other racers is so bad that they often find themselves in the same situation. All of this frustration and bad game design forced me to constantly restart the races over, over, over, and over again. If you can manage to win a race, you will win a new courses and speeds just like I mentioned before. Unlocking stuff in this game is not worth it at all as all of the unlockable tracks are just as frustrating to race on due the bad game design. The new speeds will also make the game even more so frustrating to control as you won't be able to drive for five seconds without crashing into something because of going too damn fast. The only fun I got from this game was watching the bugs and glitches you get from the crashes as they were funny to watch. This game also becomes very unstable when starting a race and there's always a 25% chance that the game will crash before you get the green light to start off your race. Difficulty in this game is defiantly on the scale of being near impossible due to the bugs but there is one track that is oddly very easy. The level is called Test Track, it is just a simple oval shaped race track that is not offensive in design. What makes this track easy is that you can just stick to the pit lane and exploit the race by staying in it and passing by everyone without collision, plus get a good time on top of that. Yep, even the easy way to win is due to the game being broken. The controls in this game are very simple with exception of camera control as you'll need to really search the keyboard in order to find them. It is best to use this game with an Xbox 360 controller for the most comfortable way to control. Heck, the controller menu is nothing but an Xbox 360 controller diagram and button layouts. Overall, the controls are the best thing about the game and that's not saying much as while simple, they are rough around the edges. Graphics in this game aren't very good at all as they look very outdated and also like cheap plastic action figures. The crowd looks like cardboard and are a pixely mess when you're up close to them. The horizons/backgrounds are very weird as they look very flat and are a bit nauseating when you look at them while driving. When you crash into the endless sky/limbo, you will see that the backgrounds are just images that you'd find on Google Maps. The motorcyclist and motorbikes look very stiff and lifeless and the animation is also just as stiff and lifeless and it doesn't set a very good mood. Music in this game is non-existent and it left me confused and made me think that I accidentally put the game on mute. 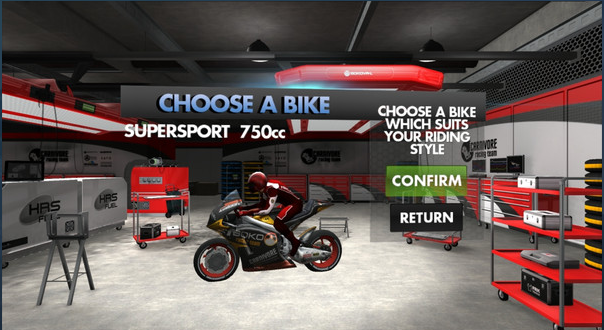 The only sound you do get in the game are the dings from selecting an option and the other sound is that of the motorbikes. The menu dings are effective and inoffensive, the motorbike sounds are very loud and obnoxious and it did get to the point where I had to mute the game. Overall, this has got to be the worst game that I have played all year and is also one of the worst racing games that's out there. This is a game that is to be avoided at all costs, do not even consider giving it a play, not even to test out your Oculus Rift. Terrible game. As a little bonus for this review, I've embedded the lets play I did earlier in the year.